Some gardeners aren’t satisfied with humdrum landscapes. They go for the individualist look. Such gardens are the subject of a fascinating book by landscape and garden designers Gordon Taylor and Guy Cooper. Weidenfeld & Nicolson published “Gardens of Obsession-Eccentric and Extravagant Visions”. 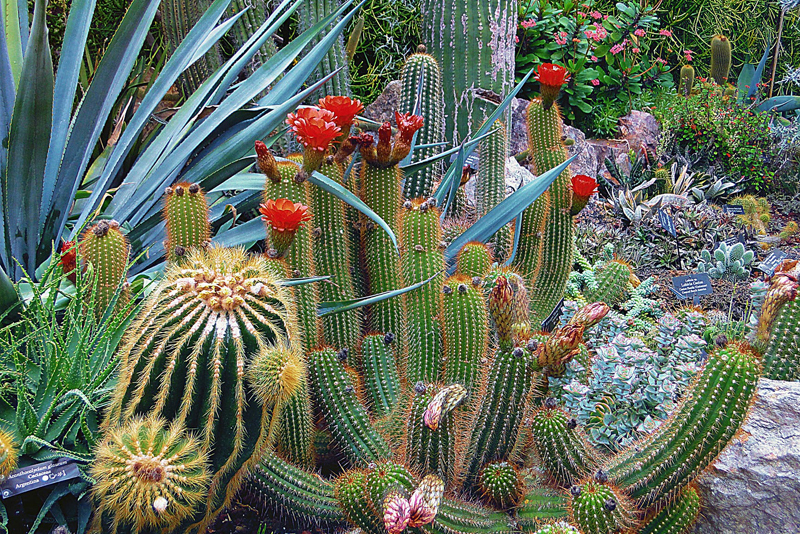 Cacti and succulent lovers will be especially interested in some of the 150 gardens that the authors chose for this remarkable book. These gardens are located in all parts of the world from Latin America and Europe to the United Kingdom. For this delightful book, the authors organized the gardens into chapters by theme, prominent feature, or subject matter. This makes the book easy to use when you are choosing ones for inspiration. There are chapters on formal gardens, artists’ gardens, surrealistic, and sculpture gardens. Others deal with topiary, trained trees, and flowers. The chapter entitled ‘The Art of the Self-Taught’ has delightful examples of what some individuals have created using a variety of different materials. Chapters featuring cacti and succulent gardens include the ones on rare plants, artists’ gardens, and surrealism. Among the gardens highlighting cacti and succulents is Lotusland in Montecito, California. This 37-acre estate garden was the creation of Ganna Walska, and it continues to be a favorite among cacti and succulent lovers. This garden is noted for its collection of ‘Golden Barrel’ cactus and euphorbias. By coincidence Dawnridge, another of the featured gardens, is also located in California in Beverly Hills. Among the prominent plants in this eclectic garden are agaves. This extraordinary garden is the brainchild of Tony Duquette, an internationally known interior designer. Succulents are given a prominent place in the garden of Claude and Francois-Xavier Lalanne, located in Paris. These artists were part of the Neo-Realistic school in Paris. Among gardeners they have quite a reputation for their animal topiaries. These are created with metal frames. One patio on their property features three giant tortoises planted with succulents.